Summer is upon us! Though the calendar may not yet officially be summer, the temperatures are already soaring around the country (and have been for a while in Arizona). Most of us have barbecues and backyard get-togethers already scheduled, and the calendar is only going to get more packed. There’s not much more unattractive in a floor than a plain concrete slab. Yet, that’s exactly what many Gilbert, AZ homes have for a patio. Patio epoxy floor coatings in Gilbert drastically improve the look of your outdoor entertaining space. You can choose from stained concrete, metallic epoxies, decorative concrete overlays, and more. Even just sealing the concrete will give it a nice shine that will make it look more put together. You have numerous options for the color and pattern of patio epoxy floor coatings, so you can match the look well with your outdoor space or your home design. Add the right patio furniture and other accessories and you’ll have an outdoor entertaining space that looks good enough to be in any home décor magazine. Concrete is relatively porous, so it can stain quite easily. You drop a plate of barbecued chicken while you’re grilling, and suddenly you have a dark stain on your patio that you either can’t get out or that takes you a lot of hard work to get out. Red wine, fruit juice, and any other dark materials or items that are not cleaned immediately can leave behind stains. By adding epoxy flooring, you add a layer of protection for your patio that makes it easier to clean and maintain. The coating protects against liquid penetration and staining, and all you have to do is mop or sweep it. That will also keep your patio looking good for a longer time and will extend its life. If you have a simple slab of concrete for your patio, the only way to get something new is to rip it up. You can’t lay pavers on top of the concrete. You can build a deck over it, but a wood deck isn’t the best choice in the intense Arizona heat. Instead of going through the backbreaking work of tearing up a concrete slab or of building a whole new structure on top of it, you can make an easy transformation by investing in outdoor epoxy coatings. You can have the new patio that you want much more quickly, and you can save a lot of money on the transformation, as well. The outdoor spaces of your home can be just as important as the indoor spaces. Having a beautiful yard and outdoor entertaining spaces can improve the curb appeal and value of your home. By doing something as simple as adding patio epoxy floor coatings, you can make your home look more attractive and you can increase its value. When you are ready to sell, you are more likely to be able to sell your home quickly and to sell it for the price you want. You still have plenty of time to add epoxy flooring to your patio before you are in full swing of summer entertaining. Get a beautiful, new look for your patio so that you can enjoy your outdoor space more and feel proud to entertain guests there. Barefoot Surfaces can help. We install patio epoxy floor coatings in Gilbert, including all types of colors and patterns. We offer stained concrete, decorative concrete overlays, and metallic epoxies. We also offer concrete sealing to protect your patio from the elements and give it a glossier finish Our outdoor epoxy coatings are perfect for patios, walkways, and other spaces. 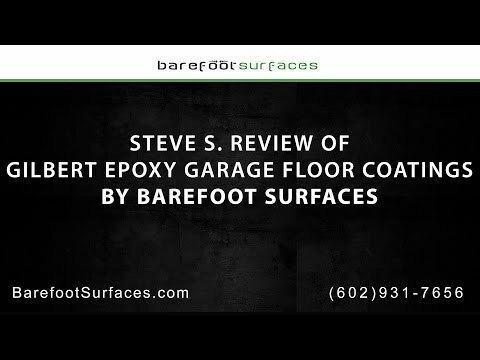 We also offer epoxy flooring for your garage and interior spaces. Contact us in Arizona today to learn more about what we can do to transform your concrete floors.